I use Ubuntu (10.04 LTS) on my servers, but the main idea should be pretty transferable. Firstly you need the ipmi packages installed, there are multiple guides for this, but the basic process is install the packages, and then enable the required modules. 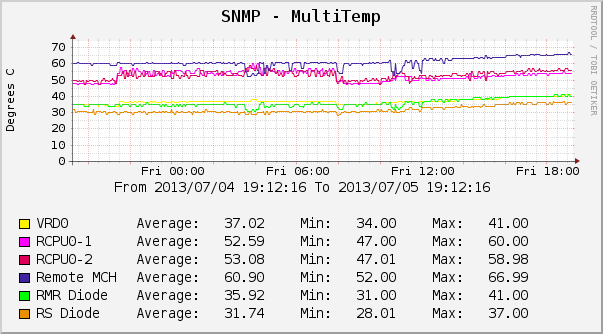 Once you have ipmi working, and $ ipmitool sensor outputting some data, we can continue. Cacti doesn’t appear to like reading data in without an id for that data. At first I tried something that gets the id from the OID, however that didn’t work, so I ‘spoofed’ some ids to make it work. The important thing is to make sure the number of ids you echo match the number of fan/temperature readings you have. In my case I have 4 fans, and 13 tempurature sensors, so I output 1 to 4 for the fans, and 1 to 13 for the tempuratures. The descriptions (descs) scripts are really optional, I just included them to make it easier to identify the readings in cacti. Rather than list all the steps here you can now follow http://docs.cacti.net/manual:087:3a_advanced_topics.3a_snmp_data_queries#snmp_data_queries, replacing where appropriate. Hopefully you should now have some pretty graphs like this!